Think of actual cash value as the eBay price of used items. It’s how much an item would go for today (same make and model), minus depreciation. So, say someone stole a computer you originally bought for $2,000, and it was 2 years into an 8 year life span (25% depreciation means $500). If that same computer is going for $1,500 today (the replacement cost), the actual cash value of your computer would be $1,000. Replacement cost is relatively simple: think of it as the “Amazon price” of how much your item (same make and model) would sell for today, if it were new. That means, if you originally bought headphones for $300 and the current retail price for the same make and model is $250, that’d be your replacement cost. Depreciation is a bit trickier, because even if you’ve kept something in mint condition, it’s still aged. Unlike wine that gets better over time, most items that are covered under a homeowners or renters insurance policy go down in value over time. Think about buying a new car – the minute you drive off the lot, it has lost value. This may go without saying, but stuff that’s damaged has also depreciated in value. Say you bought a new laptop and dropped it on the way home from the store. If you try to sell it online that day, it won’t be worth the same amount you purchased it for, even if it’s functioning properly. 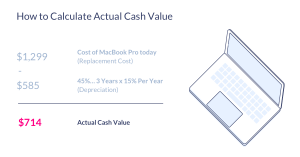 While both of the above examples highlight depreciation, keep in mind that without photographic proof of the condition your item was in, insurers will usually determine depreciation as a factor of ‘lifespan,’ which is essentially how long something tends to last before it stops working or breaks. Moral of the story? When you buy something, it gets old, and loses its value. That’s depreciation. How is actual cash value determined by insurance companies? Say you bought a TV 3 years ago for $2,500, and a burst pipe in your place damaged it beyond repair. You have renters insurance (yay!) and submit a claim to your insurer. How will your insurer calculate the ACV of your TV? Say that same TV, or a similar model (if it’s been discontinued), costs $2,000 today. That’s your replacement cost. If it was damaged three years into its 12-year lifespan, that means it depreciated by $500 (25% of $2,000). Pro tip: Make sure to always save your receipts and regularly take photos of your stuff. It’ll make a huge difference if anything bad happens and you have to make a claim. So, the actual cash value is how much you’ll receive from your insurer when a claim is approved, right? Well, not really. There’s one more thing to take into account: your claims payout is actual cash value minus your deductible. As a refresher, a deductible is an amount of money you commit upfront that’ll go towards any future claims payments. Going back to the example in the previous section, if you chose a deductible of $250, at the end of the day you’ll receive $1,250 for your damaged TV ($1,500 ACV minus the $250 deductible). Note: Here at Lemonade, we offer coverage for your stuff on a replacement cost basis. That means when you make a claim, we don’t take depreciation into account when calculating the value of your item (score! ).